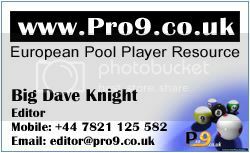 ...Another fantastic free-prize draw for Pool Fans!!! WIN A 3 DAY PAY-PER-VIEW PASS TO WATCH THE HOTTEST ACTION OF 2013! 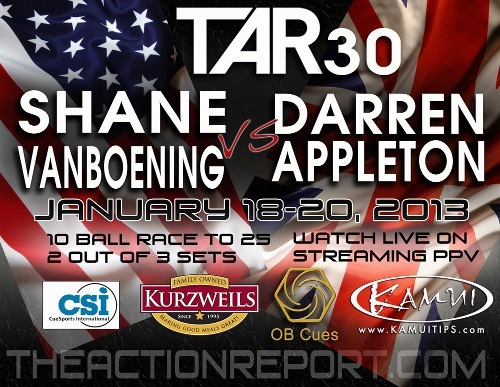 TAR 30 is the most anticipated challenge match ever, featuring two of the greatest players in the world today going head to head in 10 ball action. A race to 25, best of three sets, on www.theactionreport.com's notorious Diamond table with 4 1/8” pockets - Shane Van Boening has dominated the TAR table, but this is the distance and game that Darren Appleton likes playing most of all. It's going to be intense, and you can win a free pay-per-view pass to watch the entire event - superb quality LIVE streaming direct from the TAR Studio in Las Vegas, and repeated again and again until the next day's play starts. There's no wrong answer - just respect our sponsor's generosity when claiming your entry, and you can clain an extra entry by sharing our TAR promo on Facebook too! Coming soon! We'll be choosing the winner at the very last minute before the live stream starts on Friday, so make sure you keep an eye on Pro9's forums to see if you've won. Thanks for playing in our fun game - good luck! P.S. If you want more of these free prize give-aways, please thank us by visiting the www.pro9.co.uk website regularly, and be sure to click and buy from our many sponsors/advertisers - that's how it all works you know? So visit www.theactionreport.com for more details. ^^^ That's how simple it is to enter this competition... Here in YOUR forums!!! ...And we are still accepting more entries until Friday afternoon! wow, the Brits seem to be rather patriotic Only 16 votes for SVB out of first 50! Mikhail писал(а): wow, the Brits seem to be rather patriotic Only 16 votes for SVB out of first 50! Yes, on paper, Shane MUST be the favourite, and yes, we love Daz! ...Are you on this list yet? Only 9 free entries left now! Don't forget that TAR continuously repeat the broadcast for the next 24 hours, (actually until 2 hours before the start of the next day's stream to be precise) so you can watch any time, and many of us look out for the start time of the repeat and post it here in the forums. Visit www.theactionreport.com for more details, and get a 10% discounted pass at www.pro9.co.uk/html/SpecialOffers.php while stock lasts... (if it says SOLD OUT! then don't buy it). I wish very good luck to you all, and thank you very much for playing! ...Both winners chose Darren Appleton as the victor, and the live streaming starts in 60 minutes from now, and repeated continuously until tomorrow's action starts! Thanks for playing everyone... I really do appreciate it when people join our competitions. Day 2 starts soon - buy the Pay-Per-View now!